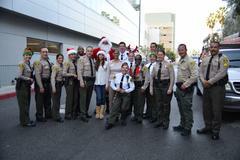 LA County Sheriff’s Transit Bureau North Captain Jennifer Bateman was joined by Red Line Sector Lieutenant Michael Mendoza, and several Transit North Bureau Deputies and Security Assistant/Fare Inspectors, to bring a little joy to the children at the Kaiser Permanente Los Angeles Medical Center, Pediatric wards on Wednesday December 23, 2015. Transit Bureau North is one of the LASD bureaus that provides police services to the Metropolitan Transportation Authority’s (Metro) buses, trains, and properties. Many of these families use Metro to get to and from work, school, or their doctors’ appointments. 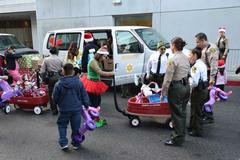 Long time Sheriff’s Security Assistant/Fare Inspector Maria Carlin, led the effort to get as many toy donations as possible. Carlin, along with North Bureau Sergeant Mauricio Avola, contacted Kaiser to see if they had a need for the toys that would be donated and collected. 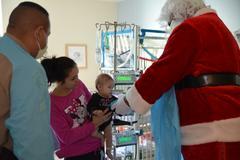 Bonnie Lindquist, who coordinates quality of pediatric patient care for Kaiser Permanente Los Angeles, was very receptive due to the large number of children that would have to spend the holidays in the hospital. Support for the toy drive by Transit Bureau North personnel was overwhelming with hundreds of toys and gifts collected, but how to distribute them? 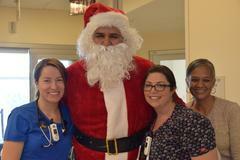 Enter 6’7” Security Assistant/Fare Inspector Jerry Rocha dressed as Santa Claus. (see attached photos) The children and their parents lit up as the larger than life Santa would enter their rooms with a believable “Ho-Ho-Ho Merry Christmas”. 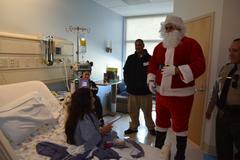 Medical Center staff and Transit Sheriff’s personnel alike were visibly moved by the reactions of the children. 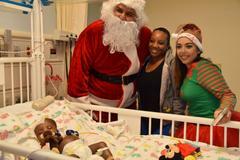 Some who had not had a reason to smile in a long time, but did so when they got their gifts from Santa and his Elves. So many toys and gifts had been collected by Sheriff’s personnel, that there was enough left to donate to several other hospitals and rescue missions. You can donate to help improve the lives of children year round. Visit www.sheriffsyouthfoundation.org and find out how to support the many worthy causes the Sheriff’s Department partners with to help shape the lives of tomorrow leaders. To receive detailed, up-to-date information directly from the LASD via e-mail, register for "Nixle" alerts at www.Nixle.com and register for "LASD-Transit Services Bureau HQ, Los Angeles County Sheriff" and also register for your local LASD station area. Or, text “LASD Transit HQ” to 888777 to receive text alerts only. Standard text messaging rates may apply, depending on your calling plan.